Gemstone Earrings - Natural gemstones vary in shape, size, and color. They also have natural identifying marks, so no two are alike. 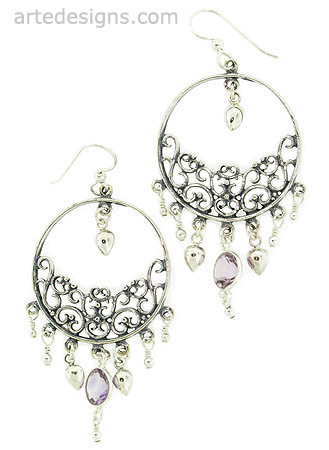 Sparkly faceted round amethyst gems dangle under flirty sterling silver hoops. An eye-catching piece of jewelry that will never go out of style. Amethyst is said to bring serenity and peace of mind. It also helps prevent homesickness. It is the symbol of security. Just under 3 inches long. Sterling silver wires. Gemstone earrings include sparkly gemstones with sterling silver ear wires. Natural crystal, garnet, amethyst, aquamarine, ruby, peridot, sapphire, citrine, blue topaz, rose quartz, blue lace agate, moonstone, labradorite, iolite, yellow jade, carnelian, tiger eye, black onyx, turquoise, and more.